The last month or so has been a pretty busy time for me. After Mhairi and I got back from our Euro road trip this summer, we were both pretty skint, so I jumped straight back into work mode on the farm as soon as I could, and Mhairi made the most of her time before she got super busy and swamped with her uni work. One super foggy morning on the farm, I was bringing in bails from a nearby field when my phone pinged, with the fog being so thick that it shielded me from view, I stopped the tractor and had a quick looksee at the email I had just received. 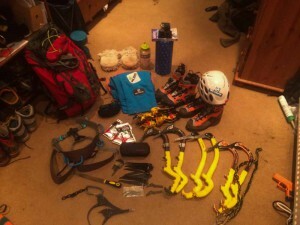 It was from ((Scot Muir )),a mixed climbing wizard and ex-RedBull athlete. 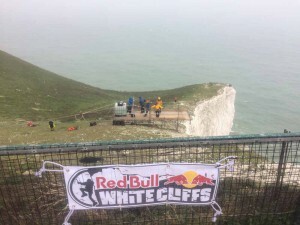 The email stated that RedBull were going to be hosting an event on the Isle of White in October to climb on the huge chalk cliffs that were found on the islands coast, and that I was one of 10 climbers from around the globe that had been fortunate to be given an invite. PSYCHED! So for the last 6 weeks there has been a lot of working and trying to fit in as much training as I could to get in sufficient shape/fitness to hold my own against the other competitors. As I usually stay well away from anything to do with climbing competitions, it was interesting to see how psyched I was for the upcoming event. 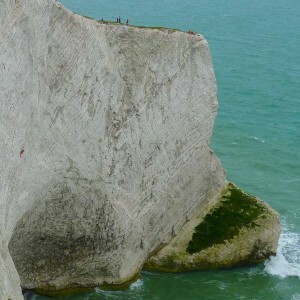 I had never climbed on chalk cliffs before, and to do it with a bunch of mates/awesome climbers from around the world, it was definitely something to look forward to. Looking across to the main platform on an overcast Saturday. This is how we do it! Grivel taking the lead. 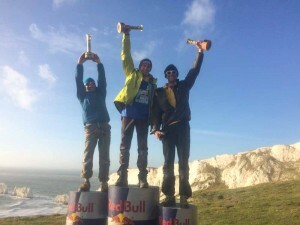 So last Thursday I jumped on a plane to London Gatwick where I met up with Ed (a RedBull staff member) and also with ((Isreal Blanco)), another athlete from Spain. 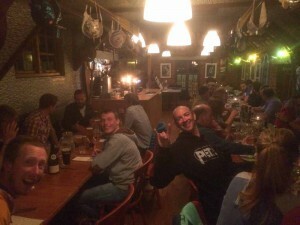 It was then onto the ferry at Portsmouth where we bumped into ((Dennis Van Houik and Mairan Van der steen)) who had spent the week climbing in the UK and were also on their way to the Island as Dennis was competing at the event. 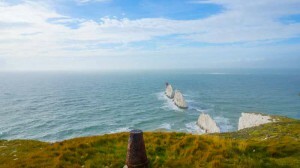 It was my first time on the Isle of White, and it was cool to see that the hustle and bustle of London and the mainland was swiftly forgotten once we rolled off the ferry. Once at the hotel we met up with the rest of the competitors and also the big team of guys and girls that were there to make this RedBull event go smoothly, safely and as fun as possible. 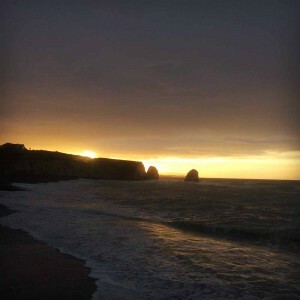 The Isle of White has some stunning scenery. From then on it was a weekend of laughs, psyche, pumped arms and making awesome friends. 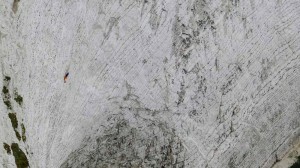 We had practice day on the Friday, were we got to have a go on the chalk lines and get a feel for the style of climbing. 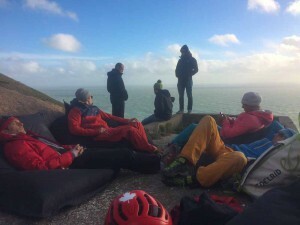 But as this was the first time this style of event had been put on, it swiftly became apparent that we were all going to have to muck in together to make the competition possible, with the weather not really playing ball, and no one really knowing the best way to work this style of climbing or chalk. But after a second day of route excavating and practice on saturday, we were all ready for the main event the following day. After a group meeting that night, we all agreed that the competition would consist of one go each on the main and hardest line we had constructed and that there would be no falls allowed. The fastest time up the grossly overhanging 120m route would be the winner. Game on! Me on the comp route. Sunday morning came around and everyone looked a little more nervous and drained from the past two big days of getting everything in order for the final sprint. Our order of start times had been decided earlier in the trip from a novel little drinking game that involved a number on a coin that had been dropped to the bottom of our beer mug, this reminded me of stories my grandad used to tell me about how the soldiers used to get recruited back in the days of world wars. Anyway… I was 8th to get lowered down the wall to the beach and as each competitor went down and then raced to the top, all were doing really well. My nerves were rising fast and I remembered then why I didn’t enjoy mixing competition with the sport that I love so much! But eventually my turn came around and as soon as I was lowered down onto the face, my nerves settled and climbing head took over. My main goal was to not rush and fall off the route, whether it be from pumping out or blowing a hold, but obviously I didn’t want to hang about either and come last. I ended up climbing the route in 27mins, which I was super psyched with as it wasn’t far off the mark of all the other athletes… well, apart from the top three guys who beasted it good and proper! The calm before the storm on the last night after the comp. Things swiftly go a little messy! But all in all it was an amazing weekend and a really cool event and I’d like to say thanks to everyone who helped out and travelled world wide to make it happen and especially to the RedBull guys who had the vision and the resources to make it work. 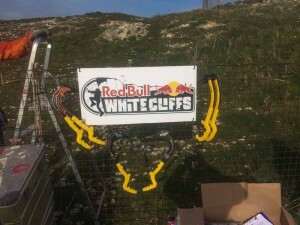 Bring on next year and some more adventures on the WhiteCliffs!